When working with files that are stored in Elvis, there may come a point that you want to save one or more files locally to use them in some way. This article explains how to download files or folders in Elvis. Info: Downloading files can be done by using the Pro client or the Brand portal. Downloading one or more files is done by searching for the files that you want to download, selecting them and subsequently clicking Download in the menu bar. You are then presented with various options to download the files, as explained below. Tip: When using the Brand portal for downloading files that are stored in multiple locations, add them to the Basket first. 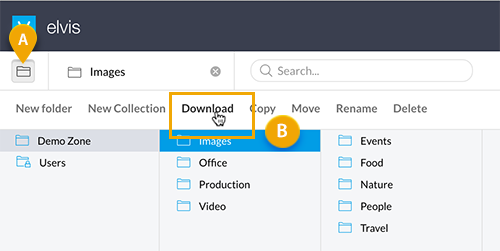 This way you can download files in one action instead of downloading them one-by-one or in small groups. Figure: The various options in the Download menu (yours may vary depending on the setup and access rights). Note: Depending on your access rights, you may or may not have access to all options. When in doubt, contact your system administrator. Images and videos are downloaded in the same dimensions but at a lower resolution. Documents and presentations are downloaded as a Web page. 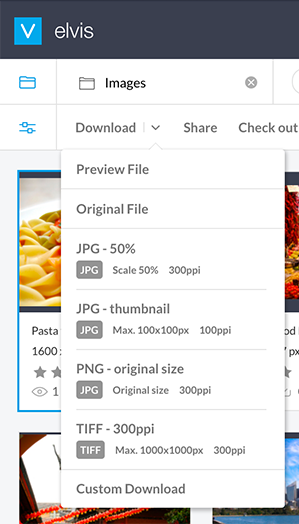 Layouts are downloaded as images. Collections are downloaded as a ZIP file containing a preview of every file in the Collection. Download original . This downloads an exact copy of the file. Download preset. Settings that are often used can be made available as Download Presets by the system administrator. This makes downloading files on a regular basis using the same download settings much more efficient. Simply click an available preset to download an image in those settings. Download custom. 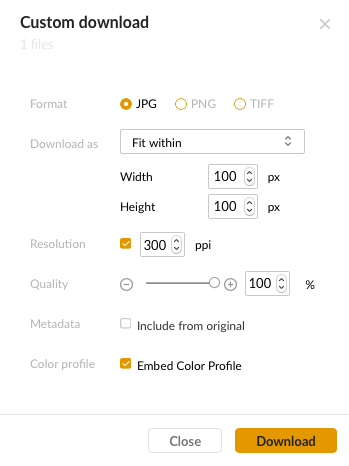 Use this option to download an image in a particular combination of format, dimension, resolution and quality. It is also possible to specify if the metadata of the original file or the color profile that was used to generate the preview needs to be included. Info: Downloading folders is available in the Pro client, not in the Brand portal. Instead of downloading a range of selected files, you can also download a complete folder including any available sub folders. Example: When downloading the Demo Zone/Images folder, all files are downloaded that are in the Images folder itself but also all sub folders and the files that are in those sub folders. To do this, use the Folder browser to select a folder to download and click Download in the menu bar. The folder, its content together with any sub folders and their content will be downloaded as a ZIP file. Figure: Using the Folder Browser (A) to download the Demo/Zone/Images folder (B).